TPC Professional Edition now supports LandXML (version 1.2). You can exchange data with many other applications with XML files. Many of our users have asked us to support LandXML as a way to communicate with the engineering world. 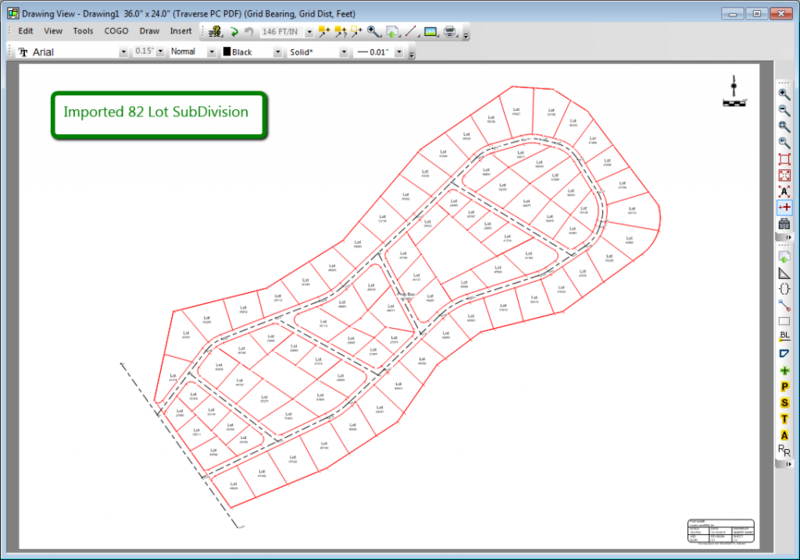 While a private survey client may be happy with a survey map, an engineering or architectural client may need surfaces, alignments, parcels, geodetic positions, state plane coordinates and so on. Many of these can be efficiently delivered in a LandXML file. LandXML is a data exchange format developed by the LandXML organization (www.landxml.org). They chose to use the XML language used by the web, and as it turns out, it was a good choice. LandXML files provide a common denominator for software programs like Traverse PC to share surveying and engineering data. LandXML has been in version 1.2 for a long time (since 2006). A newer version is currently being discussed, but as of this release, LandXML v1.2 is the latest available version. So that’s the one TPC supports. When you select a LandXML file to import, TPC lists all the data in a familiar Tree structure. You can select the main (root) branch and import the entire data set, or just import pieces like all the parcels or a particular surface. TPC then imports the LandXML data, converting it’s units to the survey units and displaying the details in the Message View. Once imported, TPC organizes parcels and alignments into their respective Traverse Groups, puts surfaces in the Surfaces Manager, points in the Points Manager and so on. 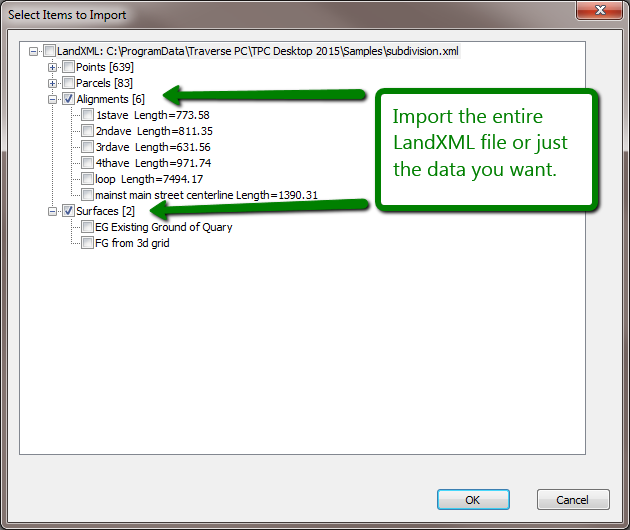 Your imported LandXML data is easy to find and easy to work with. When you export a LandXML file, you select the survey data to export using our familiar What list. This version of TPC supports the basic LandXML data types used in surveys. Our plan is to add support for additional LandXML data types as requested. CgPoints are just like ASCII coordinates. They include X,Y coordinates and elevations, GPS positions, a point label, point description, point code, etc. TPC reads and writes CgPoints. LandXML parcels correlate directly with TPC’s traverses in the Parcels and Lots Traverse Group. If you haven’t used Traverse Groups yet in TPC, now is a great time to learn. Parcels are closed loop traverses that share boundaries with other parcels and alignments. TPC exchanges the geometry of the parcel with LandXML along with location, state, tax ID and lots of other new information about the parcel. We love LandXML’s state type, that indicates whether a parcel is New, Existing, Abandoned, or Destroyed. LandXML alignments correlate directly with TPC’s traverses in the Alignments Traverse Group. If you haven’t used Traverse Groups yet in TPC, now is a great time to learn. Alignments and Traverses both have typical centerline geometry that includes stations, elevations, tangents, curves and spirals. Both can also include vertical PI’s and a profile based on an existing surface. TPC supports LandXML surfaces, including breaklines, borders and faces. Read a LandXML surface into TPC and generate the contours and labels or create a surface in TPC and export it to LandXML. 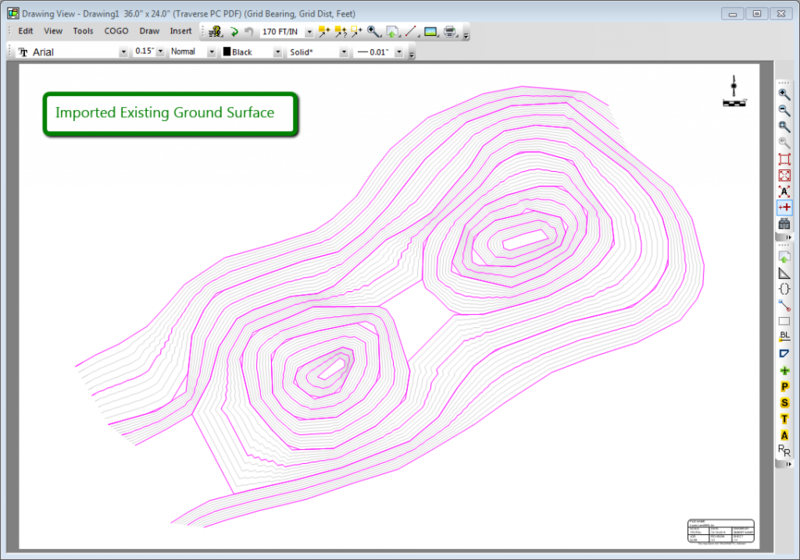 Either way, you’ll have a rich surface with lots of data you can use to generate contours, volumes, cuts/fills, slope analysis, transects, profiles and lots more. TPC now draws setback lines for you -automatically. Just tell it which lot lines are Front/Rear/Side and what line type and color to use. TPC Does the rest. 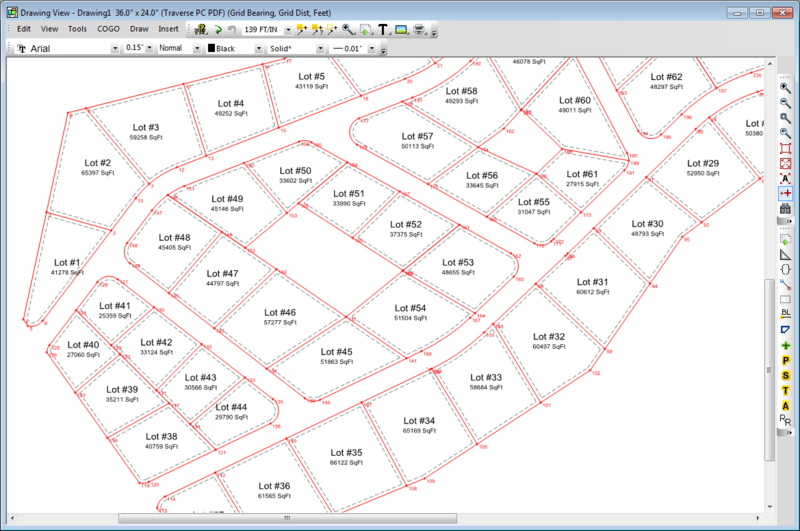 In the Drawing View shown here, we’ve imported a subdivision from LandXML and set all the setbacks to Side. 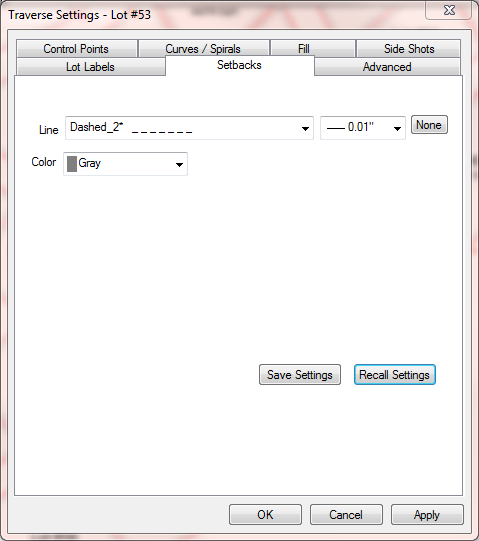 Now you can edit the lot lines and specify which ones are Front and Back. As you do, TPC will automatically compute the setbacks and update the drawing. We think you’ll be able to do most of your lot setbacks this way. And when you do need to handle special configurations, you can still use the R-O-W Offset COGO tool to manually create the configuration you need. The Traverse Properties dialog includes the new Setbacks tab. Tell TPC what distances to use for Front, Side and Rear setbacks. The next time the drawing regenerates, TPC moves the setback lines to the new distances. Each survey holds its own Front, Side and Rear setbacks in the Survey Information dialog. Then, when you create a new traverse for that survey, TPC applies the survey’s lot setbacks to the traverse. Of course, you can change them for individual traverses, but this takes care of all the busy work. Older versions of TPC Desktop didn’t include lot setbacks, so those traverses get the default lot setbacks for the survey automatically when you open the survey file. You can now access traverse properties directly from any drawing, from the Travers View and from the Traverse Manager, so editing lot setbacks is super easy. There’s a new tab in the Traverse Settings dialog called Lot Setbacks. For now, it includes just a line type, line width and color. But that’s all you need to draw lot setback lines. If you don’t want to draw lot setbacks, just set the line type to None. This is part of our Quick View technology. You tell TPC what you want to draw and how you want to draw it, then let TPC compute the offsets and draw them for you. You can focus on getting the correct setback types and distances and leave the busy work of generating the setbacks to TPC. Setback lines don’t generate survey points, but you can snap to their end points and mid-points, append them to the legend and lots of other things you will want to do with setback lines. And remember, if you need more options, you can use the R-O-W Offset tool to generate setbacks that are survey lines and points. By default, TPC assumes that all lot lines are Side setbacks until you tell it otherwise. This lets you draw setbacks right away. 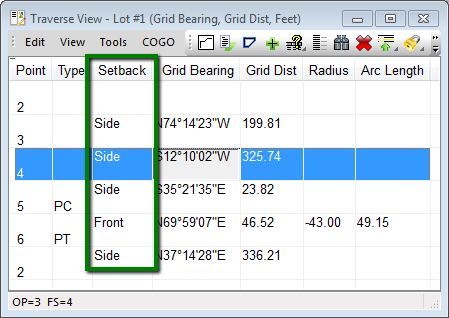 Then you can use tools in the Traverse View and the Drawing View to specify which setbacks are Front or Rear. There’s even an option to turn setbacks off (None) for very short lot lines that would otherwise get bypassed by the setback distances. In the traverse shown here, we specified a Front setback for the curve from 5 to 6. TPC now handles program updates for you automatically. Use the default interval or set your own and TPC will check for a newer version on our website, download and install it automatically and set you right back on the path to improved productivity. Since our first agile release in 2013, we’ve been giving you a lot more reasons to stay current with TPC Desktop. Each agile release includes just a few new features you can learn on the fly. And now, with automatic updates, we’ve make it easier than ever to stay current. The Survey Point Properties dialog gives you access to more information about your points. We really like the coordinates and geodetic positions displayed side-by-side. Plus you have more information about the source and status of each point. The Point tab is the primary tab for a survey point. In this tab you’ll find familiar information like point label, description, X and Y coordinates, Elevation, and Latitude and longitude. Some of the new items added to the dialog are the convergence angle and the current grid factor. Both of those items are read only and exist to provide you with additional information on your survey point. Land XML Attributes and State have been added to the Survey Point Properties Dialog too. 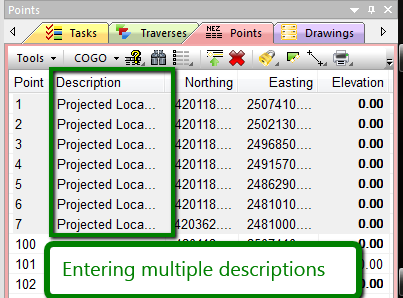 With the addition of Land XML in TPC 2015, survey points now have the ability to define their own state. The Status tab is a tab that denotes a survey point’s status in Traverse PC. Similar to the old dialog we have three checkable boxes, Topo, X/Y Protected and Z Protected which do exactly the same thing they did in previous versions, they’re just on a different tab now. In this new tab we added four read only properties that TPC automatically tags if the point has that property. The read only properties are Adjusted, Rotated, Translated, and Raw. 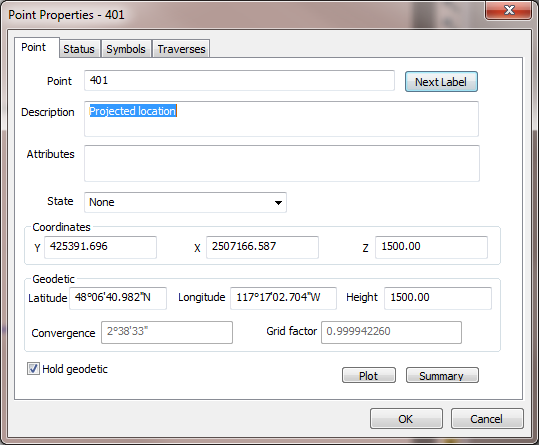 Notice that if the Rotated property is unchecked and you run a COGO-Rotate on a traverse containing that point, when you go back to the Survey Point Properties Dialog for that point the Rotated property should now be tagged. The Symbol tab allows you to change how the point symbol shows up in the Drawing View. This will overwrite the Traverse Settings for this point’s point symbol so be careful. Nothing has changed about the survey point symbol information in the new dialog expect its location. In Traverse PC 2014 the survey point symbol information was accessed by the button “Show Edit Symbol”, now it’s simply a tab in the new Survey Point Properties Dialog. The Traverses tab is similar to the “List Traverses” button in the old Survey Point Properties Dialog. The “List Traverses” button would append all the traverses that include the point in the Report View, the new traverses tab is slightly different. The tab already has a list of traverses that include the point, but this time all you have to do is double-click the traverses itself and its Traverse View will be opened in the background! Did you notice the new Summary button at the bottom right of each of the tabs? Similar to the COGO dialogs, the Summary button in each of the tabs in the Survey Point Properties Dialog appends that tab’s information to the Report View. Select multiple items in a view, then edit one of them and update all the selected items. This is a great way to make corrections to your field data or topo shots. Selected items don’t have to be next to each other. Select as many as you want, anywhere you want in the view. Then edit just one of them. Pretty nice! You can now view and edit point Attributes. 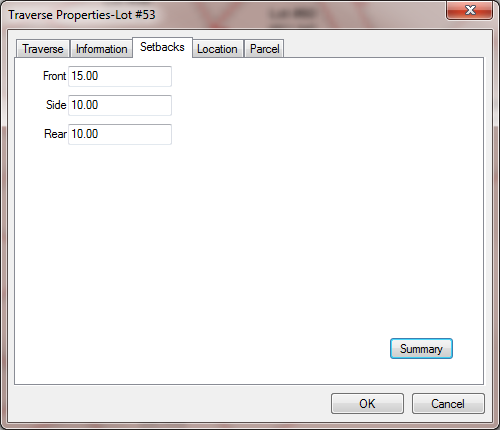 It is available in the Traverse View, Points Manager and in the Survey Point Properties dialog box. We have provided a more intuitive Settings button, replacing the old ellipses ( … ) with the gear symbol. You will see this button wherever you have settings (options) available for whatever you are choosing from the drop-down list. In this case, it is the Settings for the ASCII file type in the Import dialog box. You will also find this button next to Traverse Formats and Traverse Settings in the Traverse Properties dialog box as well as other places. Note that this button does not replace the Program Settings wrench button. We want to distinguish between overall Program Settings (wrench) and individual options settings (gear). If you were on the TPC Connection in 2014, you received TPC Desktop 2014 Release 0, Release 1 and Release 2. We packed a lot of stuff into those agile releases and have really enjoyed your feedback on the releases. So what if you weren’t on the TPC Connection? Well, you didn’t get all that great stuff. But you can in the TPC Desktop 2015 update. That’s how it works now. We role everything from the year’s agile releases into the next full annual release, like TPC Desktop 2015. Then we start on new program features for the 2015 agile releases, which if you are not on the TPC Connection, you can’t get until 2016. Why New ‘What’ List Item? What Else Can You Do with the New ‘What’ List Item?